Bridges and barns are one of my favorite things to see when we travel, especially along country backroads. Since moving to Tennessee, I feel like I’ve come to love and appreciate them even more! The Rock City Barns, as iconic as they are, are getting harder and harder to find as are covered bridges in Tennessee. 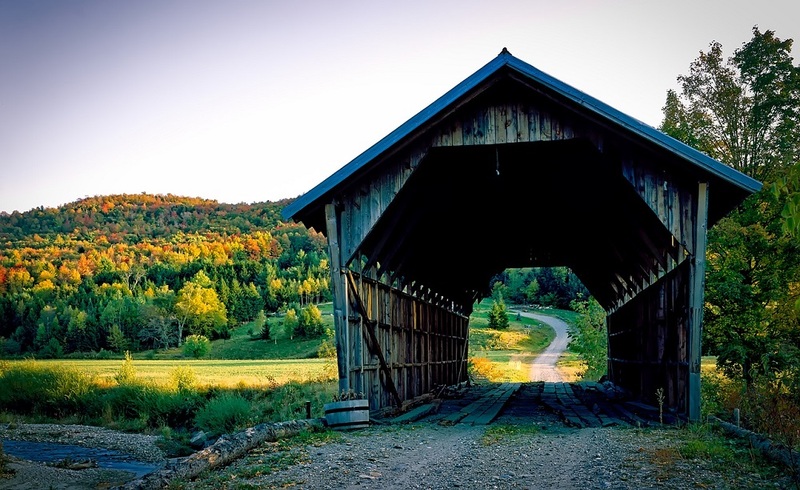 There is something poetic and nostalgic about covered bridges speaks to me. Often historic and protected as a cultural structure in the area, I marvel at how something made of wood can survive so much wear and tear. With years of braving the elements and standing up to continuous use, the covered bridges in Tennessee that are left all tell a story. A few months into our Tennessee residency, a coworker was telling me about the covered bridge not far from his house. 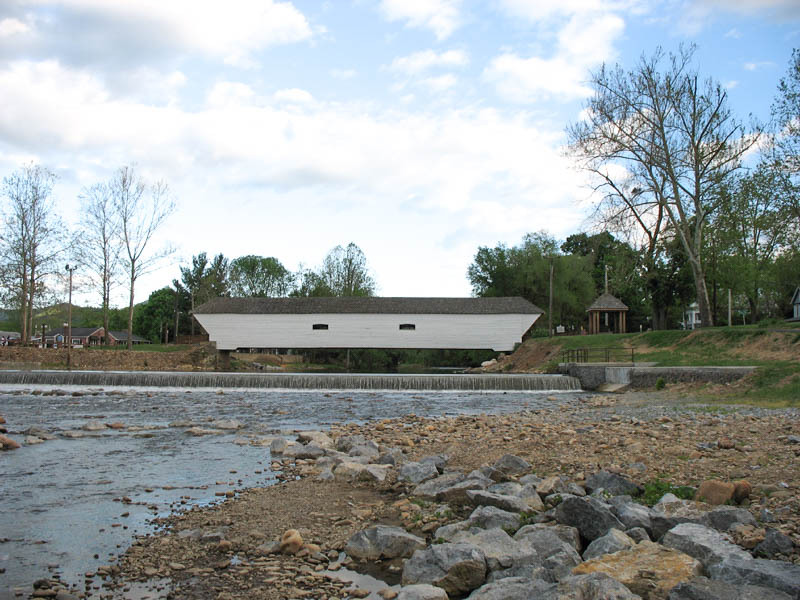 I started to do research on the Harrisburg Covered Bridge and soon discovered that there are a handful of others ones in the state. The Elizabethton Covered Bridge is a 134-foot covered bridge over the Doe River in Elizabethton in Carter County, Tennessee. Constructed in 1882, the bridge connects 3rd Street and Hattie Avenue. Currently, the bridge is closed to all motor vehicles but does allow for pedestrian and bicycle transit. The bridge is an important focal point and landmark in the state. Along with more of Elizabethon’s downtown the bridge is listed on the National Register of Historic Places. 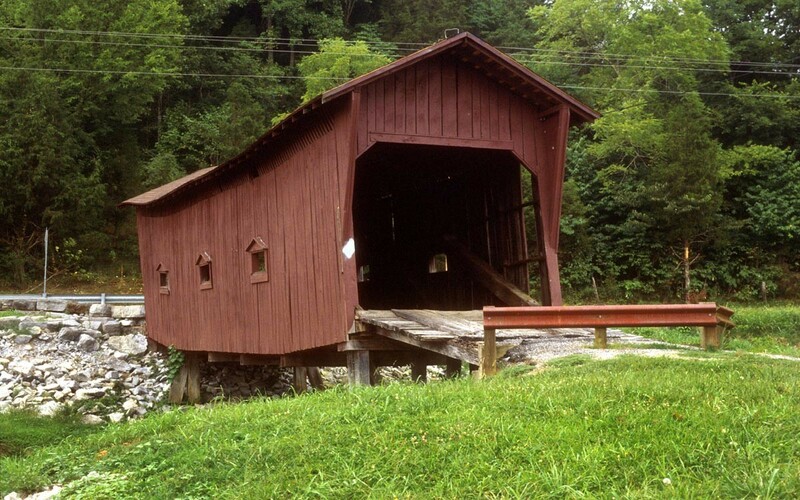 In Greene County you will find the historic Bible Covered Bridge that was built in 1923. The bridge stretches acrossthe Little Chuckey Creek at a ford that connects the Bible farm with the Warrensburg Road. In 1975 the bridge became a historical structure. 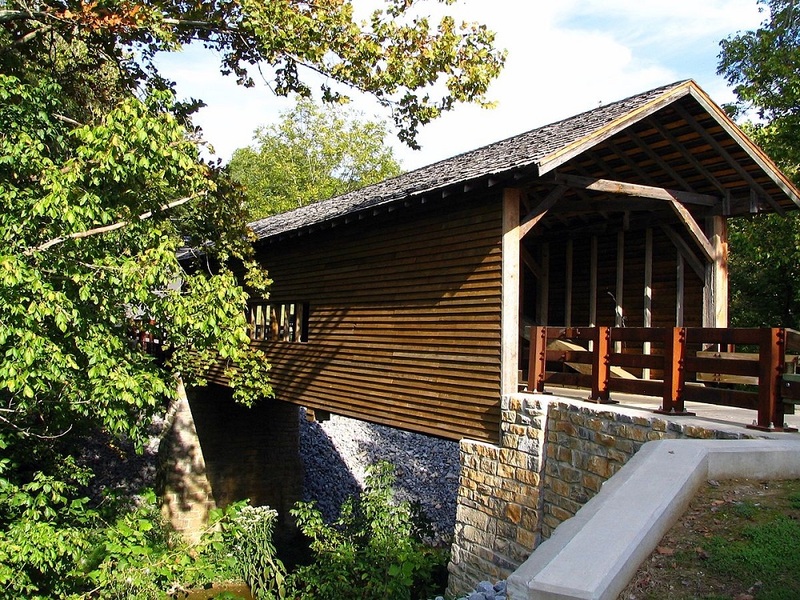 The Harrisburg Covered Bridge can be found in Sevier County and crosses the East Fork of Little Pigeon River and was built in 1875. In the late part of the 19th century, the population grew around Harrisburg as more people immigrated to the area. Life in the area flourished with the presence of many local mills and blacksmith workshops. However, after 1915 when the new bypass was built around Harrisburg the community slowly dwindled as many people moved away. The bridge was almost demolished in the 70’s until the Daughters of the American Revolution stepped in to save it. They group raised the funds needed to rehabilitate and save the bridge. The bridge was added to the National Register of Historic Places on June 10, 1975. Cars are still able to cross the bridge, but there is a weight limit. The Harrisburg Covered Bridge was the first covered bridge that I drove over so it holds a special place in my heart. It sounded like a wooden coaster as the drove over the wooden beams. We even looked at buying a house near the bridge! If you are in the area, there are a number of historic places to check out in the Smokies. The Parks Covered Bridge ,built in 1904,is the only one of the states historic covered bridges that is located in the western part of the Tennessee. Originally, the bridge was located between U.S 51 and State Route 211. The bridge was rebuilt in a city park where it lost its place on the National Register of Historic Places. Though there are only four historic covered bridges in Tennessee, there are a number of newer covered bridges in state that are also full of character and charm. If you have time they are also worth visiting.